This user guide will help you start analyzing URLs shared by your focus company and companies in your landscape. The examples in this user guide will look at Cross-Channel Posted URLs, but you can always narrow your focus to a specific channel. 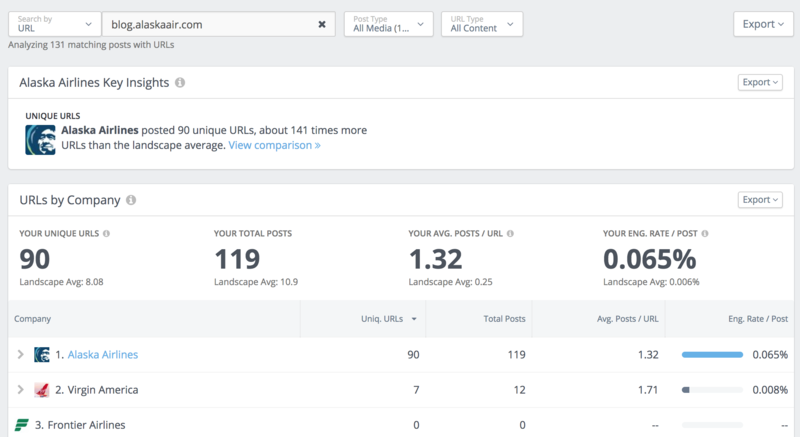 The Posted URLs feature analyzes only social posts with links posted in them. 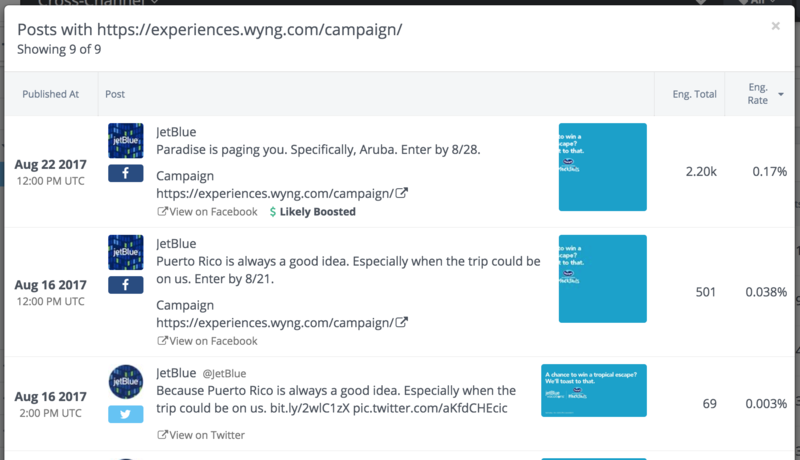 This way we can provide insight into how and where companies are using links in social posts. First, compare how many social posts with links is in this analysis by looking at the number of matching posts noted under the search bar. 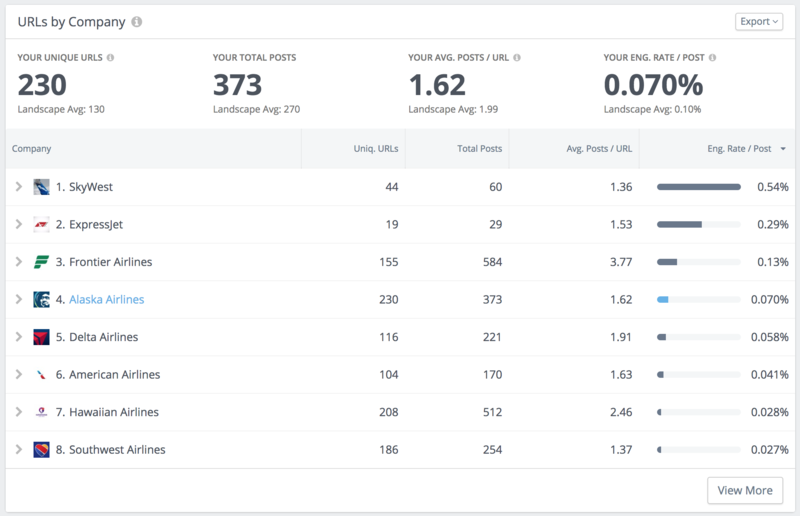 In this example, this landscape had a total of 5.87k social posts, but only 1.58k social posts had URLs posted in them. This panel gives you quick and powerful insights into the URL sharing strategies in your landscape. If a competitor is posting a link more frequently than usual, you will receive this insight to help you listen to what is being actively promoted in your landscape. 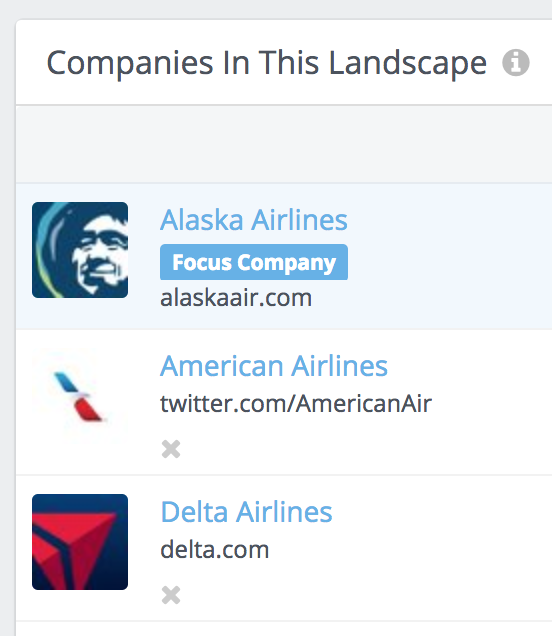 Use this insight to learn which domains companies in your landscape mutually share links from. These might be domains you want to include in your strategy. Use this comparison to understand how your owned vs curated content sharing strategy is similar or different from that of your competitors'. 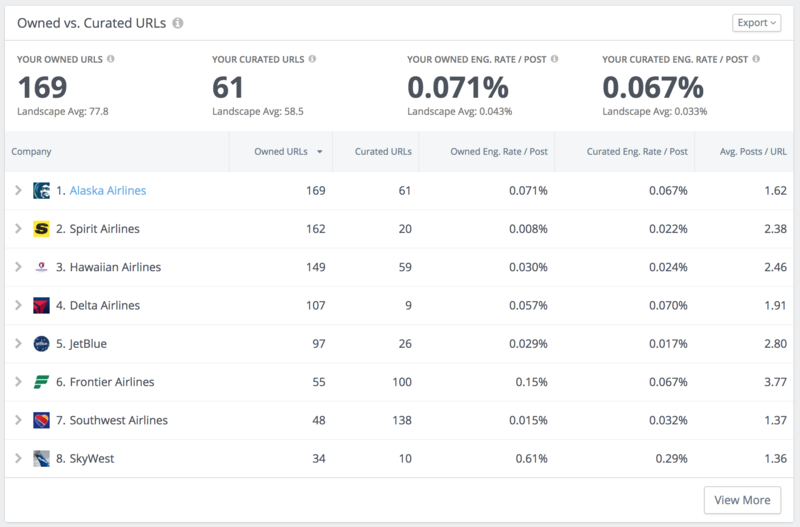 We compare the number of URLs you and your competitors share to help you understand how link sharing plays a part in your social strategy. Tip: If you do not see any insights in this panel, take a look at a longer date range to see if we can detect any key insights on a larger set of posts. This panel summarizes the URL sharing activity by companies in your landscape. Use this information to compare how many URLs each company shares, how frequently they share each URL, and whether posts with URLs engage audiences. 1. How many URLs do companies in my landscape share? And where do I rank? With the Unique URLs column sorted in descending order, you can quickly see the effort each company makes to share linked content with their audiences. In this example, the focus company, Alaska Airlines, shares the most unique URLs. 2. Do my followers engage with my posts when I share URLs? 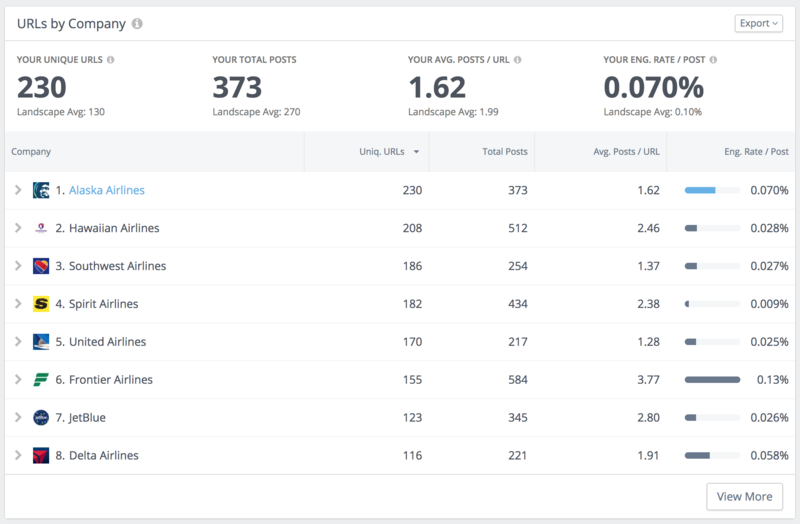 Compare your social posts engagement rate to the engagement rate on posts with links. To do this, first look at the Activity & Engagement panel in Social Posts, sorted by engagement rate / post. 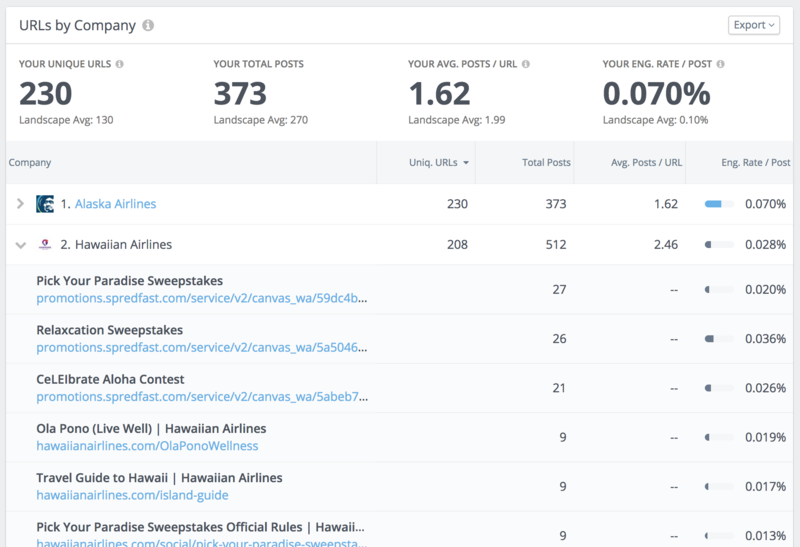 Alaska Airlines receives an average of 0.28% engagement rate / post. Then, sort the URLs by Company panel in Posted URLs by engagement rate / post column by clicking on the column header. 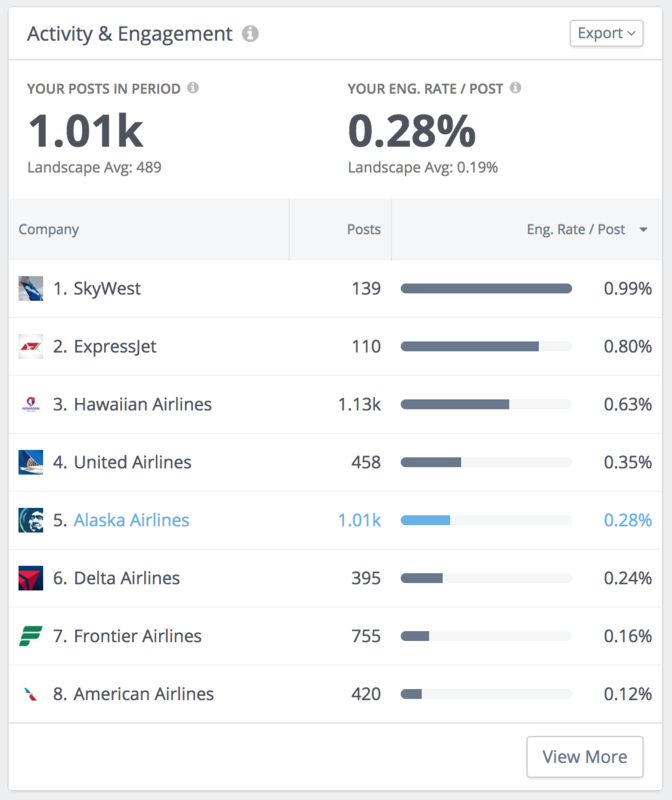 For social posts with URLs, Alaska Airlines has only a 0.070% engagement rate / post, much lower than the average for social posts overall. 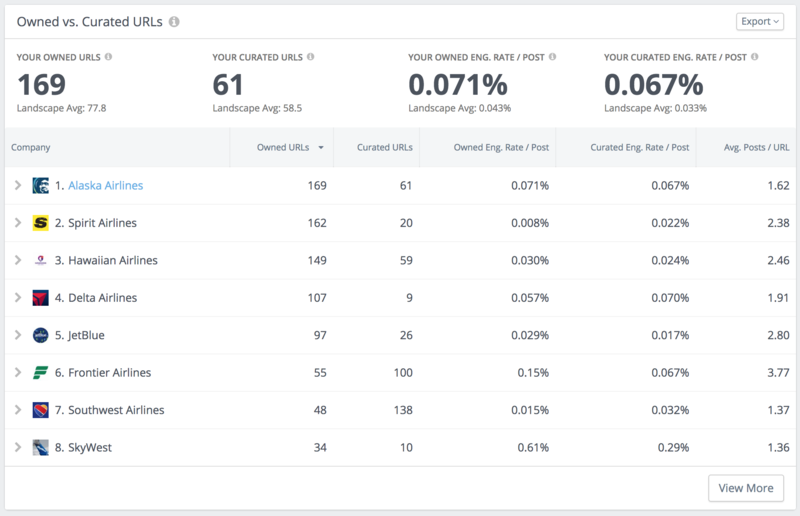 To understand why posts with URLs aren't performing, we can use the following panels to look at which domains and URL types may not be performing well. 3. What have companies in my landscape been actively promoting? Use this technique to quickly find out where your competitors are trying to their audiences. First, click on the Total Posts column to sort it in descending order. Then, click on the ">" Expand arrow to the left of a company name to view a list of the URLs the company posted. The Total Posts column tells us how many times the company used that link in social post, and in turn the effort they made to make sure their audiences saw the linked content. Click on any of these rows to look at the social post content that shared the URL and engagement each post received. This panel helps you understand the content curation strategy for each company in your landscape. The top of this panel summarizes your strategy and compares it to the landscape average. An "Owned URL" is a url that points to the company's website, and a "Curated URL" is a URL that points to 3rd party content. 1. Do I receive more engagement on posts containing links to owned or curated content? Look at the panel summary to compare the number of Owned URLs to the number of Curated URLs you share. Which do you share more of? 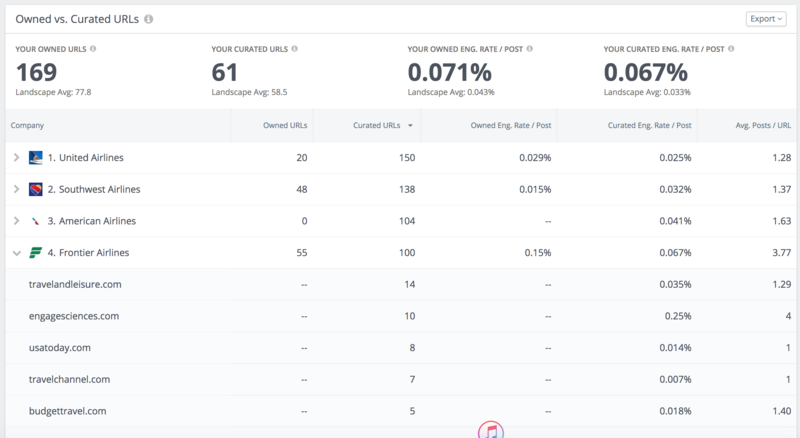 Then, compare the Owned vs Curated Engagement Rate / post to find whether you receive more engagement on posts linking to Owned content or Curated content. In this example, this company shares more Owned URLs than Curated URLs and receives slightly more engagement on posts containing Owned URLs. Therefore, they may want to continue with this ratio. 2. What are my competitors’ content curation strategies? Click on the Owned URLs or Curated URLs to sort the values, then compare the differences in the numbers. Do companies in your landscape share more owned or curated URLs? Which company has a similar strategy to yours? Half of the companies in this landscape shares more Curated URLs than Owned URLs. However, some of the competitors in this landscape may want to change their strategies. 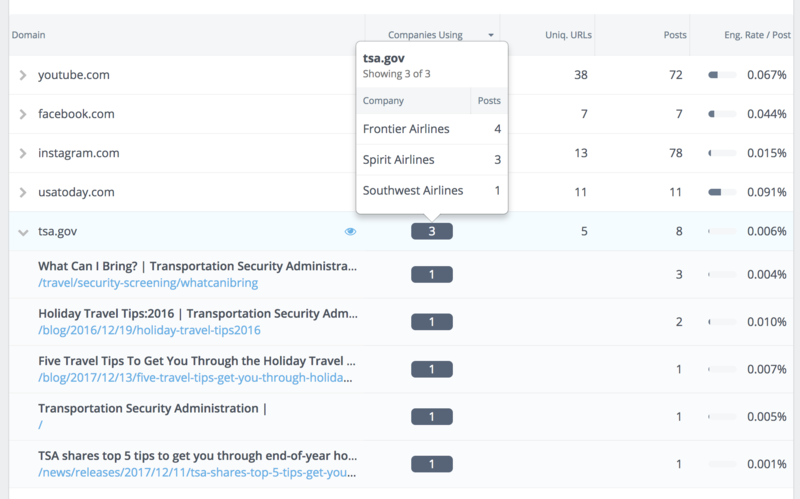 For example, Spirit Airlines receives a higher eng rate / post on posts with Curated URLs, but posts Owned URLs more frequently. 3. Which third party websites do companies share content from? Sort the Curated URLs column in descending order by clicking on the column header. Then click on a "<" Expand arrow to the left of a company name to reveal the domains the company share the most URLs from. Frontier Airlines shares more Curated URLs than Owned URLs, and they share the most Curated URLs from travelandleisure.com. This panel lists all of the domains of URLs shared in social posts. 1. Is there a popular domain I should be sharing content from? 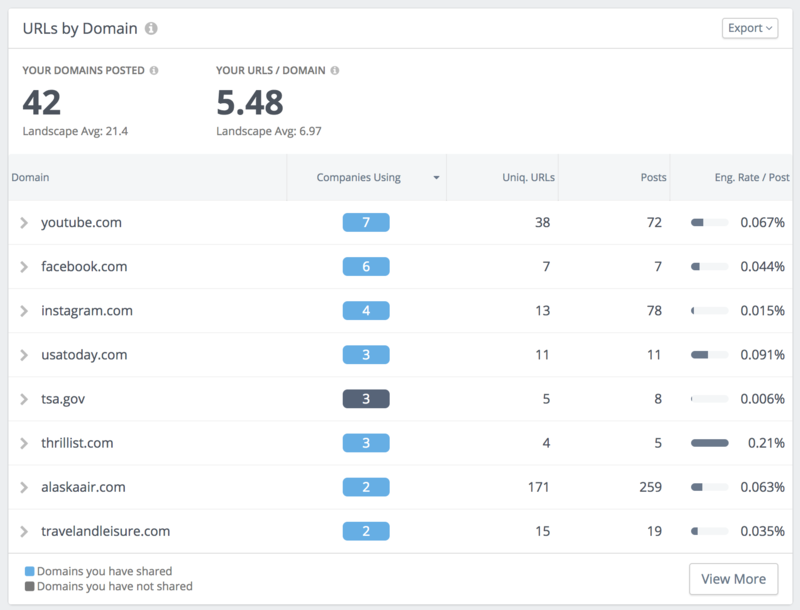 First, filter the analysis to view only "Curated" URLs so that you are looking only at other 3rd party content companies in your landscape shared. Then, sort the table by Companies Using descending to view common domains companies in your landscape share content from. The blue pills mark the domains that you posted links to, while the dark gray ones are domains you did not. In this example, tsa.gov is a domain that 3 companies in this landscape posted a link from, and the Alaska Airlines did not. This also seems like a trustworthy domain that might be resonate well with audiences. 2. Which curated domain is highly engaging in my landscape? Why? With the only Curated URLs filter still set, sort the URLs by Domain table by Eng Rate / Post descending. We can quickly see that there are a few engaging 3rd party domains that the focus company isn't sharing content from. cbsnews.com is interesting because it has a high Eng Rate / Post and more than 1 company shares content from here. By clicking on the row, you can view the social posts that shared URLs from that domain. This will help you see what the social post said, what the link is about, and the engagement each post received. This panel lists all of the URLs shared in social posts by companies in your landscape. You can use this table to explore the activity and engagement received by sharing specific URLs. 1. Did multiple companies share the same URL? Why? With the table sorted by Companies Using descending, you can see which URLs multiple companies shared along with which URLs your company did not share. Hover the pill to see the companies that shared that URL. Then, click on the URL row to view the social posts that contain this URL to find out what was being promoted. 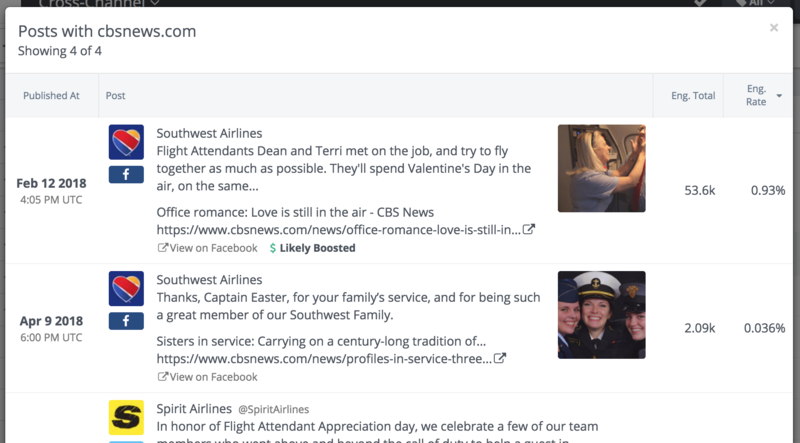 With the release of Posted URLs in Rival IQ, you can now search for posts containing a particular keyword, hashtag, OR URL in both Social Posts and Posted URLs. The entire analysis will update to filter according to your search. 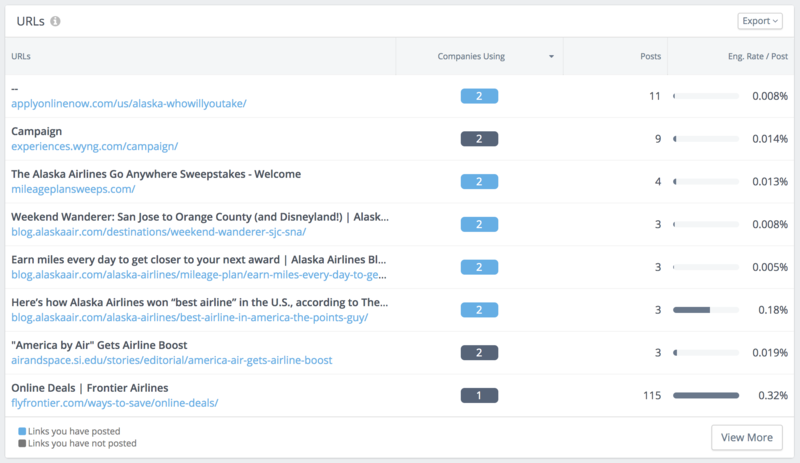 For example, if I want to analyze only the social posts that contained links to "blog.alaskaair.com", I can apply that search and quickly find that Virgin America also shared links to an Alaska Airlines website. Use the Post Type and URL Type drop downs to filter your analysis by type of post (content, photo, video) or type of URL (owned, curated). Can I analyze URLs posted on all social channels? Posted URLs can be used on Cross-Channel, Facebook, Twitter, and Google+. Unfortunately, we cannot analyze links on Instagram, Pinterest, and Youtube posts because of the nature of these platforms and API restrictions. Can I analyze shortened URLs (like bit.ly)? Yes, all shortened URLs have been expanded! For example, a URL like "bit.ly/rival_iq" may expand to "rivaliq.com/blog" and will be displayed as "rivaliq.com/blog" in Posted URLs. Along with the URL, we will show you the title of the webpage for that URL. What is an Owned URL vs a Curated URL? We consider a URL that points to the company’s website “Owned”, and a URL that points to 3rd party content “Curated”. And we define the company's website by the domain used in the company within Rival IQ. For example, the Alaska Airlines company has the website URL "alaskaair.com". When they post a link to alaskaair.com in a social post, we consider that an Owned URL. 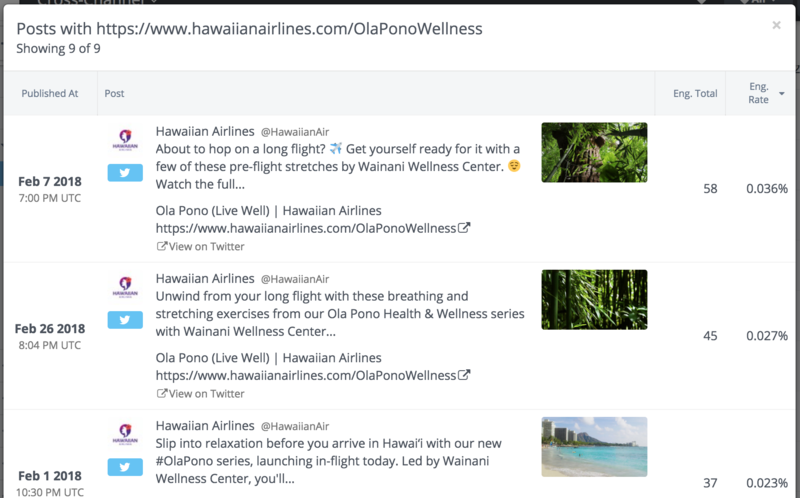 Even if Alaska Airlines shares a social post in another post (for example, shares a link to its own Instagram post on Twitter), we still only consider alaskaair.com as an Owned URL. Sometimes a company's website is a social link. For example, the American Airlines company above uses "twitter.com/AmericanAir" as its website URL. We do not consider that as an Owned URL.